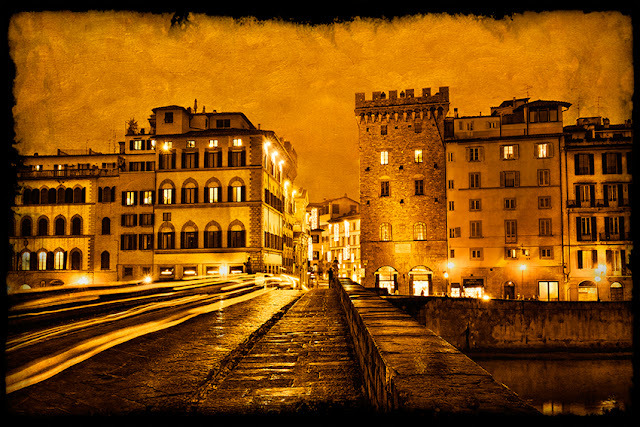 Florence is beautiful at night. The city becomes even more glamorous, and is a much different presentation than the daytime view. A long exposure captures the taillights of passing cars as streaks of light. Rain makes the cobblestones and streets more reflective, a perk of inclement weather. To create this look with your image, you can use Colorize from Nik Color Efex Pro. This will transform the look of any image, creating a warm radiant glow. Try adding a layer of texture for drama and definition. A texture layer aptly named Ovid Banished, from Flypaper Textures added a painterly touch of brushstrokes throughout this image. As a finishing touch, try one of the edge treatments from OnOne PhotoFrame. I chose Acid Burned in black to complete the look shown above. OnOne Perfect Photo Suite 6 will be released in late October. There are exciting new additions to Photo Suite including Perfect Portrait and Perfect Effects! You can use promo code debsandidge for a discount for anything OnOne. Nik Color Efex 4 was just announced yesterday! Kudos to Nik for updating the number one favorite filter set for photographers. You can preorder Nik Color Efex Pro 4, and you can use promo code dsandidge for everything Nik. Have fun creating artistic images!